How to Apply for Common Law Admission Test 2018? CLAT 2018 notification announced on 1st January 2018 for admission to Undergraduate and Postgraduate Law degree programmes in 2018-19 for 19 National Law Universities in India. As per the MoU (memorandum of understanding) between National Law universities in India, CLAT entrance exam is conducted each year to allow students to apply to all 19 NLUs in one go. 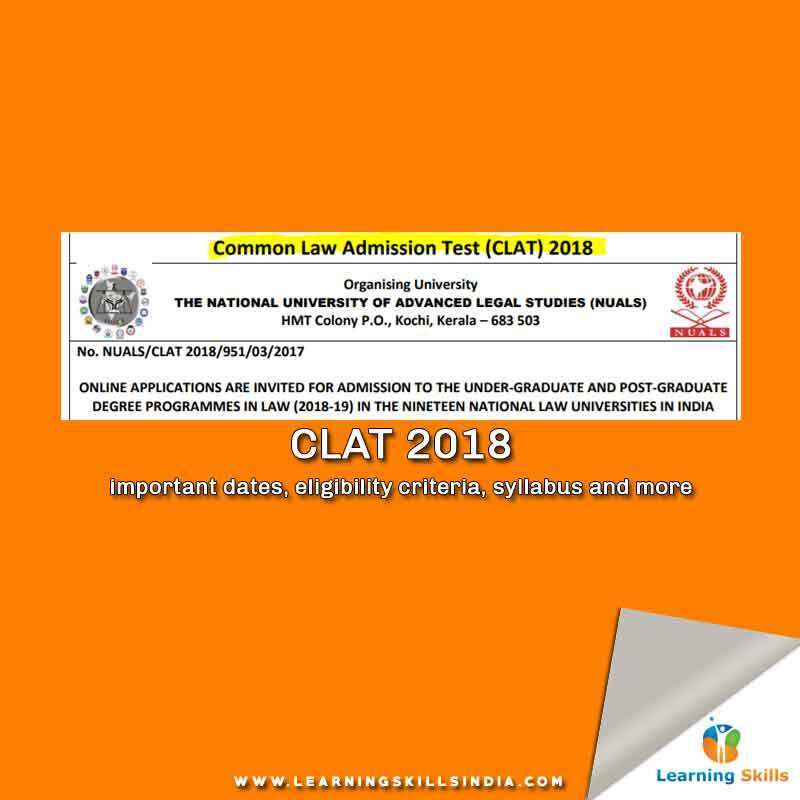 The CLAT 2018 entrance exam for LAW programmes at NLUs is being conducted this year by The National University of Advanced Legal Studies (Kochi, Kerala) – NUALS. Last year, it CLAT was organized by Chanakya National Law University (Patna, Bihar). All 19 NLUs are the top ranking premiere law schools in India. Therefore, admission to NLU can get you high flying career in Law right after graduation. Under the CLAT 2018, there are two separate categories for Five Year Integrated Honors Law Degree and one year LLM Degree in all 19 NLUs. The Five Year Integrated Honors Law Degree is an undergraduate programme, meanwhile, One Year LLM Degree is a postgraduate programme. The further relevant information related to CLAT 2018 notification is provided below that includes important dates, eligibility, syllabus and more. Five Year Integrated Law Honors Degree: 10+2 from the recognized school with at least 45 percent marks for general, OBC, PWD, NRI, NRI sponsored, and 40 percent marks for SC and ST candidates. Candidates in 12th class, who are appearing for March/April final exams are also eligible. One Year LLM Degree: LLB degree from recognized University with at least 55 percent marks for general, OBC, PWD, NRI, NRI sponsored candidates and 40 percent marks for SC and ST candidates. Candidates in final year of their LLB degree course are eligible.